Oh. My. Goodness. I think the Great London Yarn Crawl might be the best way to spend a day in the world ever? I was expecting the yarn crawl to be good – I mean, it’s a day touring the craft shops of London, so it was always going to be fun. But in the end, the crawl surpassed all my expectations. Let’s rewind a little and talk about what the Great London Yarn Crawl is. An annual event, organised by the fab ladies behind Yarn in the City, the yarn crawl is a series of meticulously planned tours of London’s craft shops. This year there were twelve routes taking in thirteen different shops around London. At the end of the crawl, all the groups meet up for an after party in a London pub where some fabulous door prizes are given out. I joined Team Nupps for the day, led by the lovely Salina. The aforementioned Salina, aka the best yarn guide in the world! Our route took in three shops – I Knit London, Liberty and The Village Haberdashery. I felt like a bit of a fraud taking this route as I’ve visited two of the shops before, but I know myself well enough to realise that I would struggle to organise myself sufficiently to start anywhere I didn’t know how to get to! In the end, I was still late to arrive even though I Knit is right next to Waterloo station (where I go through every day with my commuter crochet). After a spot of coffee in the nearby Four Corners Café (which is a new discovery for me – I might have to start getting to London earlier on work days just to enjoy their lovely flat whites! ), we started our yarn crawl in I Knit. As its name suggests, I Knit is very much a yarn shop. 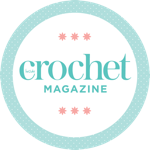 You won’t find other crafty bits in here (with the notable exception of buttons) – it’s very yarn-focussed. As per usual, I found myself falling for some Fyberspates yarn in I Knit! The huge selection of yarn made this a great place to start the day. We all enjoyed a squish of a few skeins, and I had an “accidental” splurge on a couple of balls of Louisa Harding Amitola. I’ve never used a Louisa Harding yarn before, so I was extra excited to pick some up! I Knit have their own range of yarns, I Knit or I Dye, which were much admired by the team. Their Zombie Apocalypse colour range was fab, and the names raised a few early morning chuckles. Aren’t the Zombie Apocalypse yarns fab? I Knit is well known for their shop dogs. As humans, we were treated to few little cuddles – passing dogs were not as well received! We spent a happy hour or so browsing the range in I Knit before moving on to our next stop. Liberty has always been one of my favourite shops in London. You can feel the history of the place seeping out of the walls when you go in. The timber construction of the building is just beautiful – with intricately carved wood adorning most of the door frames. If you’ve never been, even if you’re not into yarn, you must go! Liberty in London – it’s like shopping in a museum! The haberdashery department on the 3rd floor is not somewhere I’d really thought to shop for yarn before. I usually go to Liberty for the perfumes! The 3rd floor was a revelation. I love everything about this – check out the balls of yarn hanging from the ceiling! Liberty stock a huge range of Rowan yarns – I must confess, I’ve not used a lot of Rowan before, finding them to be a little high in price. Seeing them all beautifully displayed in Liberty, however, is just the best way to see them. The Rowan cushion display in Liberty was a treat – note the gorgeous leaded windows behind! The staff in Liberty were really impressive. We had a little chat with Georgia Farrell, a fab knitting designer who was making up a sample of her Torte cardigan design from the latest Rowan magazine. It’s absolutely stunning – the geometric designs up the back really spoke to me! Look at those geometrics! I’m a big fan of this, and I feel like the chunky yarn might actually mean I could finish it this year! Outside the yarn section of the department, there were a whole host of other wonders to behold in Liberty! Look! It’s like fabric heaven! I’ve been a fan of Liberty print fabrics for as long as I can remember, having picked up a Liberty book bag on one of my first ever trips to London. Just being in the fabric room was such an amazing treat! I need to improve my sewing quite dramatically before I could justify a splurge in here, but I think I might start just going to Liberty’s fabric room whenever I need a cheer up. I loved these prints – particularly the triangles! The haberdashery in Liberty is all just perfect – I loved the careful way they select their products to maintain a classy, slightly retro aesthetic. The sewing kits and accessories were packaged beautifully! I fell a little bit in love with the fabric bundles in Liberty, but the prices were a bit steep for my sewing skills! I love the displays in Liberty. They use fabulous pieces of furniture to display their pieces in a relatable (but aspirational!) way. I also want this sideboard! I ventured into the homeware and bath departments next door, and things were just as beautiful in there. This dresser gave me serious house goals! The whole place is basically a real life Pinterest board – I loved seeing it through fresh eyes, even though I didn’t end up buying anything. This shop was a completely new one on me. Based in West Hampstead it’s a bit outside of my usual stomping ground – I tend to hang out right next to my office, in Soho or right next to Waterloo! The Village Haberdashery is such a find – I’m so delighted to have been there on the crawl. They have a lovely yarn section, with Malabrigo, Manos Del Uruguay and Sweet Georgia amongst their fab selection. Excellent though the yarn section is in the Village Haberdashery, I couldn’t help but fall in love with the fabrics! Look at these wonderful fabrics! I couldn’t resist! In a bit of a rash decision, I bought myself some gorgeous fabrics in the hopes that one of these days I’ll learn to quilt! It took a lot of hard fabric-wielding work, but I finally settled on these (and one more, but ssssh!). Look at some of the treats I came away with! I also loved the stationery and the paper crafts section at the back of the shop – the ink pads and the rubber stamps almost snuck their way into my stash. The stamps and ink pads were so tempting! I left the Village Haberdashery on a bit of a high and we headed off to the after party. Arriving at the after party was a bit of a shock! Having spent the day in our little Team Nupps bubble, it was amazing to see how many people were actually involved in the event. The door prizes were fabulous. I was a bit gutted not to have won anything… until I took a proper look in my goody bag! Look at this beauty! Yes, that’s Erika Knight yarn hiding in the goody bag! After all the prizes were given out, everyone in the room collectively realised how exhausting it is spending all day yarn shopping and the place cleared out pretty quickly. I managed to share an Uber with Sarah from Crafts from the Cwtch and Lynn, moderator supremo of an amazing CAL crochet group on Facebook – it was so nice to meet yet more fab crafters at the end of such an incredible day. It was such a great event – I can’t believe it was my first! I’ll definitely be making sure it’s not my last! Yep, I officially envy you now. That really has got to be one the best ways to spend a day! Thank you for sharing at The Really Crafty Link Party this week! *SWEET*! — These Spots have just been added to my “PILLAGE”-LIST for “WHEN-IF-EVER” I make it across THE-POND again! — BTW, do these “crawls” come with “LUGGAGE-BEARERS”..? This sounds like lots of fun! I love a look around Liberty, it’s always so interesting. I haven’t crocheted in ages…. I really must start again, I always found it so therapeutic. I have shopping day envy (and that doesn’t happen to me very often!) What a lovely event, spending time with other likeminded people is always great. What an amazing event, I think I could have easily spent a small fortune in those shops.